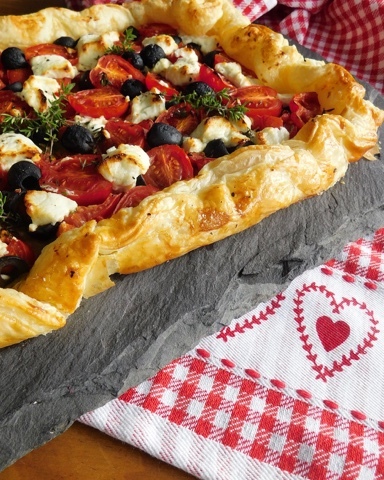 A wonderful rustic style vegetarian tart which showcases Scottish tomatoes to perfection. 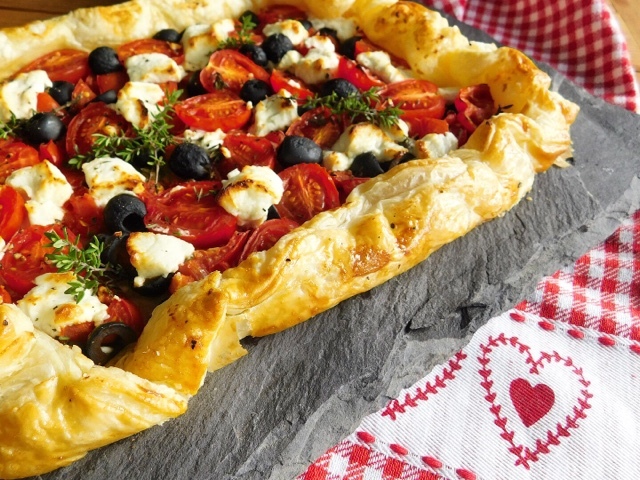 Flaky puff pastry combines with sweet tomatoes, goats' cheese, olives and thyme for a simple yet showstopping seasonal supper. Today's recipe is one that is a particular pleasure to share with you as it champions an initiative to bring back Scottish tomatoes to the commercial growing market. 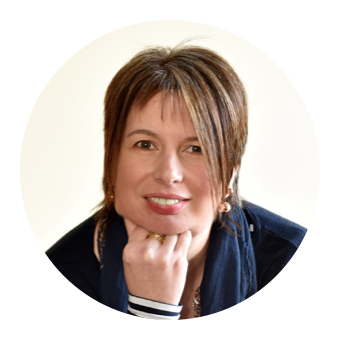 It may surprise you to learn that Scotland was once a tomato-growing force to be reckoned with but over the years the previously thriving industry fell into decline. 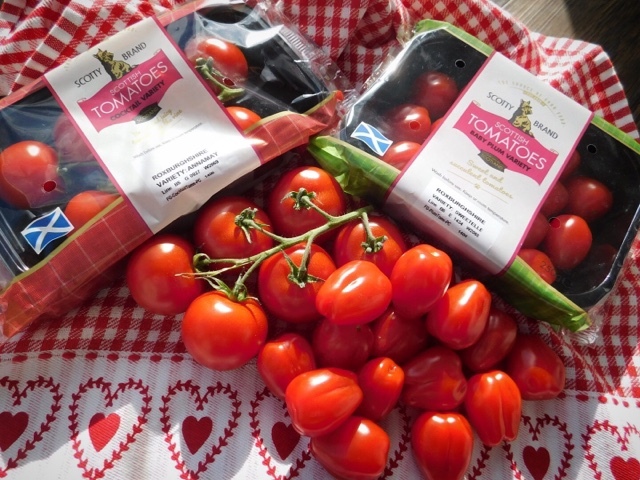 Scotty Brand have been behind the drive to resurrect Scottish tomatoes and welcome them back to their product range this Spring. 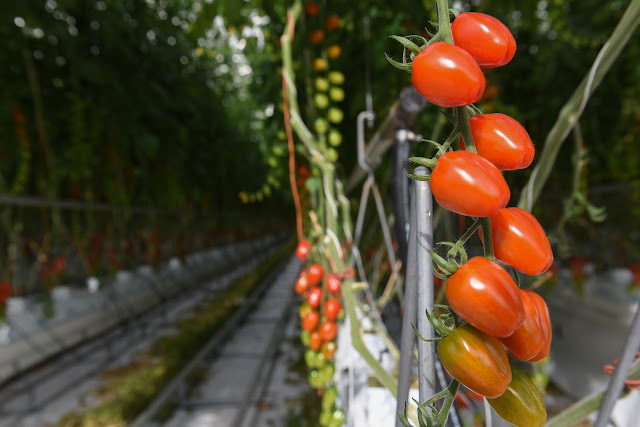 Their tomatoes are grown at Standhill Farm near Hawick in the Scottish Borders where Scotty Brand have been working with farmer Jim Shanks since last summer to overcome the various challenges of commercially growing the crop in Scotland. 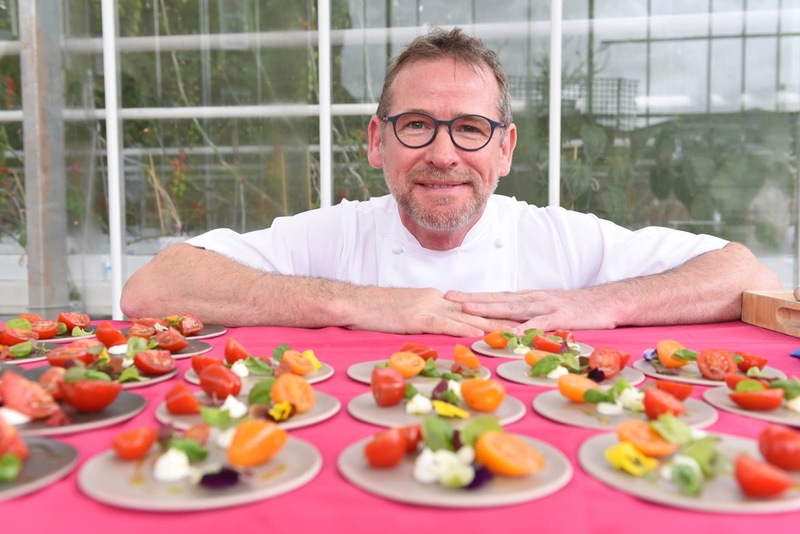 The Scottish climate does have its advantages too, as the tomatoes ripen at a slower rate than those grown in more southern climates, resulting in a sweeter and tastier crop. Water for the tomatoes comes from rainwater falling on the roof. Electricity likewise comes from biogas. Heat comes from an ultra-efficient wood-chip burner which is fuelled by wood from the farm and surrounding area. The glasshouse is equipped with thermal screens both to preserve heat and, occasionally, to reduce the heat of the Scottish sun. Pollination is carried out by bees especially brought into the glasshouse. Do track some down - I promise you can really taste the difference. (But PLEASE don't keep them in the fridge!) The smell of tomatoes as you open the pack is mesmerising and took me straight back to my Granda Monearn's small greenhouse when I was a child. And the flavour is just how tomatoes used to - and should - taste. Unroll the puff pastry onto a large baking sheet. Roughly chop up the cocktail tomatoes. Place them in a bowl and add the crushed garlic, smoked paprika, halved olives and the leaves from a couple of sprigs of thyme. Season well with salt and pepper and mix thoroughly. Use a slotted spoon to transfer the tomato mixture onto the middle of the puff pastry leaving a 5cm strip all the way round. Crumble the goats cheese into chunks and cut the baby plum tomatoes into halves. Nestle the cheese, whole olives and halved tomatoes on top of the tomato base. Fold in the pastry sides to form the galette and brush with beaten egg. Bake for around 20 minutes, or until the pastry has puffed up and turned golden and the goats cheese has gratinated. Serve garnished with a couple of extra sprigs of fresh thyme. Disclosure: This is a commissioned recipe for Scotty Brand. As always, all views expressed are my own. I'm a massive fan of savoury tarts/galettes, especially this time of the year. 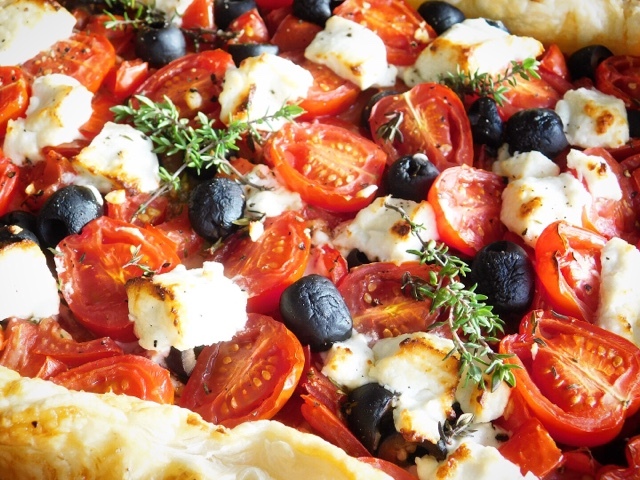 Love this Mediterranean-style goat cheese+olives+tomato combo, it's perfect for a lunch-box or for brunching during the weekend! Up to a year ago I never ate olives and used to run away from recipes like this. 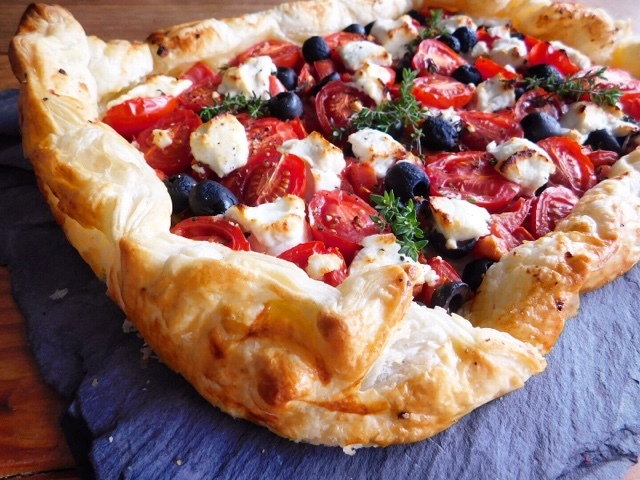 Now this galette looks truly tempting with the beautiful tomatoes! Oh my gosh this sounds amazing. Just my kind of thing - all my favourite ingredients! Can't wait til I'm allowed to eat soft goat's cheese again! Scotland? Tomatoes? Together? But it's so cold. Well, i guess I've learned something today. This tart has some fantastic ingredients inside of it. It would be warmly welcomed by the entire of my family. This is just gorgeous! Incredible bright flavors, a rustic feel. Looking forward to trying this soon! I am all about savory galettes! THis looks so delicious and flavorful! Beautiful galette! I wouldn't have guessed that you could grow tomatoes in Scotland. But living in Spain and experiencing the "real" fruits & veggies often with no taste I get what you are saying. What a tasty looking tart. And a very interesting post. Couldn't agree more that tomatoes from sunnier climes often taste well rather bland to say the least. Lush! As an avid tomato grower I find the regular supermarket tomatoes such a huge disappointment. In fact, when my growing season ends I can't bring myself to buy fresh ones for months! All my favourite punchy flavours in there, ideal for summer eating.